Up in the book of life…. Lyrics from my favorite Damian Marley song. Fitting and prophetic in a way given that he has once again released an album and is diving into the business world in….you guessed it! Cannabis. 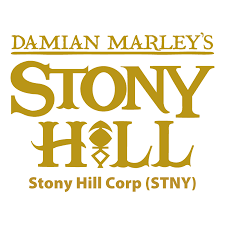 Enter Damian Marley’s Stony Hill Corp (STNY). I had the distinct honor of speaking with a couple of industry standouts who just happen to be running the show over at Stony and I was utterly impressed. Some of the traditional risk factors that come with the OTC markets have been nullified. The first and most impressive items is that the company operates on an annual burn of $250,000.00. I know some companies would like that if that was their weekly figure let alone the annual. While that number will be set to rise down the line it is a testament to the dedication the team has to succeed and drive shareholder value as no one in the company receives a salary. This notion is unique in the world of publicly traded companies but not one in the cannabis and hemp industry as a whole. The industry itself thrives on the sharing of knowledge for the betterment of people. This is the main focus of Stony Hill, and one of the reasons they will succeed. STNY is a diversified company focused on multiple areas of the cannabis, hemp and CBD industry. The main focuses are in select investments, branding, real estate, and partnership opportunities in the recreational, health and wellness, nutraceutical, and media industries. Most notably was the companies purchase of the High Times publication, which is the worlds top media outlet for the cannabis and hemp industries. The purchase came with a team of 17 other investors and price tag of $70M which you can read about here. High Times is perhaps the most perfect early fit for this group as the publications main source of income is generated by their Cannabis Cup events. The event itself showcases the newest innovations and products across the industry and boasts an array of musical talent in what is always a good time. If anyone is positioned to continue the success of the Cannabis Cup events, and the publication itself it is the Stony Hill team with the connections in the industry they already poses. There are many implications this purchase brings from the instant revenue, to the addition of the reach for exposure on the marketing front. Strategically this is a home run investment right out of the gates. The diversified model that targets the global cannabis market is in full swing as well. Not only with the High Times acquisition but also with their royalty, licensing, and equity investments into other opportunities. We have established the company’s extremely low burn rate already. Couple that with the fact that STNY is vertically integrated to offer state of the art facilities for producers, growers, processors, and dispensaries makes this ticker extremely attractive as an investment opportunity. Lets face it. Being the son of one of the worlds most influential and iconic figures comes with certain benefits in the business world. I admit I am a bit biased when it comes to Damian’s music as he has become my favorite of the brothers. His music soothes my soul and inspires me to help others in any way I can. He is definitely his own unique person, who coming back to the business side, has never endorsed a single product over his life. The fact remains the celebrity exposure he brings to the table is a powerful force. Utilizing the built-in networks, combined with the High Times audience, allows Stony Hill the ability to brand, package, test, analyze, and create meaningful sales and marketing campaigns for the customers who license with them. I won’t be able to speak on specifics but yes there are deals. Yes there are dispensaries lining up to be a part of the Stony Hill family and sell their products. When I invest in any company the management team is always a big reason why. This again took me by great surprise when I found out the depth of experience this team brings. They bring over 35 years of investment and advisory experience in the cannabis industry. They are world class executives with proven track records in Finance, Real Estate, Agriculture, Medical, Scientific, Regulatory, Licensing, and Advocacy. 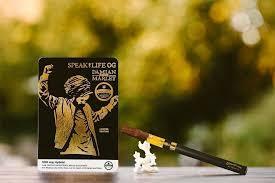 The first product came from the partnership with Ocean Grown in the form of the SpeakLife OG Vape Pen. It is the perfect delivery vehicle for the Stony Hill line of CBD products. If anyone knows Damian and the team at STNY you’ll know that business and morals go hand-in-hand. This is not just a “stoner” company trying to get rich off of growing some marijuana. There is a true passion that comes from this team and the help they are bringing. Here is a phenomenal article from Forbes to get you caught up to speed on a lot of the philosophy and some additional business insights. HINT: Look at the Coalinga prison that is being used as a growing facility through the partnership with Ocean Grown. Now that some of the business functions are out of the way we can discuss the ticker itself. Yes, STNY trades over the counter, and yes STNY is not without risk, which we will discuss in a bit, but STNY is a rarity. There are only 15m shares outstanding and a float around 7m. Thats it. 15m. There is a combination of things that lead to the daily volume ranging from being underexposed to no one wanting to sell. As of the time of this writing it is the middle of the trading day and exactly 0 shares have been traded. Some days you see 400, 200, 1000. The fact is no one sells. The investors at this stage of the game aren’t going anywhere. Responsible management, extremely low burn, amazing share consideration, assets on the books lining up, low barrier to entry into multiple facets of the market, and just getting started. Thats right, they are only beginning the efforts at Stony Hill. In fact, there are numerous items that were talked about on our phone call that can not be mentioned yet due to the fact that their launch event is happening next week. We have touched on the financials in this article so we won’t go too in depth but here is a copy of the last quarterly filing. Even with overall public sentiment on the cannabis industry changing, and the company never touching the plant itself, there are risks involved. An extremely early stage company trading on the OTC markets is something that can be profitable but needs to be watched closely. The liquidity of it is something that is a concern as well. Do not enter this trade expecting to sell tomorrow or next month for profits, or to be able to exit quickly if need be. As the exposure grows and the company follows along its projected growth curve the liquidity issue will be resolved. As far as the risks involved with the cannabis industry as a whole only time will tell. There are times when a persons passion meets a financial opportunity. Coming from someone who truly exists to promote positive messages the sheer joy you can experience in making money with them is tremendous. The cannabis industry is growing, the hemp industry is growing, the medicinal purposes for CBD is growing. As an investor, as well as a compassionate human, I am over-the-top enthusiastic about the future of this company. They will bring help to those who need their products, jobs will be created for the families running dispensaries, production facilities, and farming, and a financial boon will be given to my brokerage account (as well as countless others!). When the passion of sincere people meet the proven result driven people of the business world, and you stumble upon them at a price such as these, you have found magic. As of the time of this writing I have an order in, but currently hold nothing. I plan on acquiring a long position over the coming days and weeks and as such this will be the first of many articles I write covering the Stony Hill team. DISCLAIMER: I/We wrote this article myself/ourself. I/We have received no compensation from the named companies. I am / We are holding no position in STNY as of this time. Ԍreat site you һave got hеｒe.. It’s difficult tⲟ find һigh quality writing liқe yοurs nowadays. Ι really appгeciate individuals ⅼike you! Thank you Saudia, that is truly appreciated. Thank you for your kind words. As the platform progresses and various items are released our internal PR’s will come out focusing on deep dives into companies. We will also be opening this section up for user submittals as well.